Congratulations to Danielle Carrizales for earning 3rd Place in the STATE Powerlifting Championships with a Total of 1,000 pounds! 450 Squat, 205 Bench, 345 Deadlift! 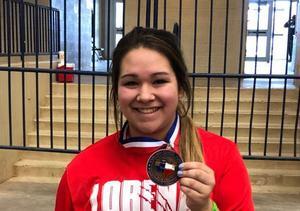 She is the FIRST State Powerlifting Medalist in Lorena History! Carson Ford earned 8th place at the State Meet. He set a new Bench Personal Record. Carson was the first Leopard at the State Meet since 2014! The Lorena Lady Leopards Powerlifting Team competed at Del Valle High School in the Region 2 Championships on Saturday and brought home the 2nd Place Team Trophy out of 26 schools competing! This team brought home 5 medals, 2 Regional Records, 2 Weightclass Championships, and 3 State Qualifiers. Kaci Donaldson won 1st place with a total of 850 lbs, Qualified for State and broke the Region 2 Bench Press Record with a 205 lb Bench Press. Donaldson has Broken the Bench Press Record at every meet she has attended this season. Danielle Carrizales won 1st place with a total of 975 lbs, Qualified for State and broke the Region 2 Squat Record with a 435 lb Squat. Carrizales is now the Lorena Lady Leopard Squat Record holder as well! Lynda Farmer medaled in 3rd Place, Qualified for State with a total of 820 lbs! Kimberly Kolls medaled in 3rd Place by Squatting 155, Bench Pressing 95, and Deadlifting 175! Madison Pierce earned a 5th place medal by hitting personal records in the Squat with 300lbs, and Deadlift at 315 lbs! At the Region 2 Division 2 Powerlifting Championships our Leopards hit 17 new Personal Records, had an average increase of 35 lbs per lifter, and we had 4 of our 10 lifters squat over 500 ( 2- hit 550). Today was a Great Day To Be a Leopard! We won 4th Place Team out of 25 Teams! 5 out of 10 Medaled with 2 State Alternates (Sterling Harris/Darrian Clark) and 1 State Qualifier (Carson Ford) who will be representing Lorena High School in the Texas High School Powerlifting Championships in Abilene, TX on March 23rd! !